Pic: James Cookson of Northumberland logs with John Cooper, digital engagement manager at iNorthumberland. Northumberland Logs, based on the Meldon Park Estate, near Morpeth, supplies locally produced, sustainable firewood for fires and wood burners the length and breadth of the region. Since the upgrade to superfast broadband, completed as part of the multi million pound iNorthumberland roll-out, the company has been able to launch a brand new website enabling customers to order online and ensure they are well stocked with logs for the festive season. Owner, James Cookson, said: “The upgrade to superfast broadband could not come soon enough for us as a business. Our broadband speeds have rocketed from extremely slow to around 30Mbps. This has helped us massively as we’ve launched a new, more interactive website which allows customers to choose from a vast range of products and for the whole transaction, including payment and delivery, to be processed seamlessly. “We’ve been able to add more products to the website and many customers are already finding it a much easier way to do business with us than having to drop everything to make a phone call. With demand for firewood growing each year Northumberland Logs prides itself on being a little bit different. “All our logs are British, with up to 90 per cent of what we produce grown on the estate and the rest sourced from other parts of the region. What started out as a business selling waste wood from the estate has grown beyond our expectations. We have pledged to plant 250,000 trees on the estate by 2025 to ensure we are truly sustainable. The faster broadband speeds are also going to help the business as they invite customers to “cut their own Christmas tree”. 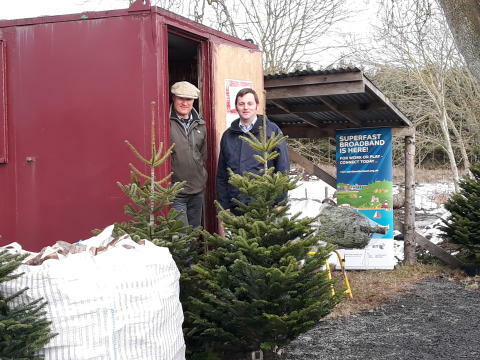 They have been offering the service for more than 30 years, but every year the increase in demand and enquiries rockets, with more and more people wanting to turn their annual Christmas tree purchase into a special event. “Coming to the estate and actually choosing and cutting down your own tree really captures imaginations and kick-starts the spirit of Christmas. We now see grandparents bringing their grandchildren where previously they brought their own children who are now mums and dads. It’s a really special way to choose your tree. Councillor Nick Oliver, Northumberland County Council's cabinet member for corporate services, said: "It’s fantastic to hear that the roll-out of fibre broadband is making a real and tangible difference to people’s lives and businesses. "Northumberland Logs is demonstrating that not only is superfast broadband transforming customer information and ordering - but it has also enabled the company to employ more staff, providing a further boost to the local economy." Engineers from Openreach, the business responsible for Britain’s largest phone and broadband network, completed the Meldon Park upgrades. Around 80 homes and businesses in the area, mostly farms and individual homes, have also benefitted from the upgrade which has boosted speeds to up to 80Mbps using fibre-to-the-cabinet (FTTC) technology. iNorthumberland, a partnership between Northumberland County Council and BT Group, has already made fibre broadband available to more than 55,000 premises across the county. More than 47 per cent of Northumberland households and businesses able to upgrade to the new technology have already chosen to do so - a figure which is among the highest levels of take-up in the UK. BT Group was awarded the iNorthumberland contract in April 2013, whilst the second phase contract was signed in June last year. More than £29 million is being invested in the programme area by Northumberland County Council, the Government’s Broadband Delivery UK (BDUK) fund, BT Group and the European Regional Development Fund (ERDF). For more information about Northumberland logs or to cut your own Christmas tree please visit https://www.northumberlandlogs.com/.